Garrett Mathes picked up a pair of hits in yesterday’s 8-7 win. Mathes now has an eight-game hitting streak. 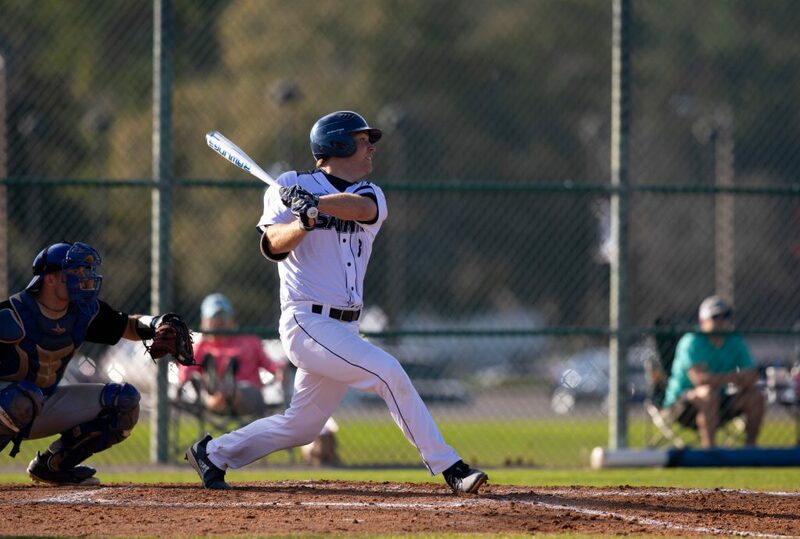 February 7, 2019 – The Santa Fe Saints baseball team pulled off an improbable comeback over Hillsborough Community College Hawks by scoring seven runs in the bottom of the eighth inning to win 8-7 Wednesday afternoon in Gainesville. The Saints had three hits in the uprising, but took advantage of two hit batsmen, two walks, an error and a balk. With two outs, Zach Hand drove the first pitch he saw bringing in the tying and go-ahead runs with a single that plated Cade Westbrook and Isaiah Perry. Things weren’t going well at the beginning for the Saints as the first two Hawk batters in the opening inning reached on errors and came around to score. HCC (1-5) scored three more in the third inning and single runs in the fourth and fifth to take a 7-0 lead. The Saints scored their first run in the fifth when Perry reached on a fielder’s choice and later scored on a double by Cale Jones. SF recently moved up to No. 2 in the FCSAA rankings and are presently ranked No. 12 in the nation. The Saints (9-1) will host TNXL Academy out of Kissimmee Friday for a 3 p.m. game.